Not a piano, the company. Steinway Musical Instruments Inc., the legendary piano maker controlled by U.S. hedge fund billionaire John Paulson, has attracted takeover interest from China Poly Group Corp., people familiar with the matter said. The state-owned conglomerate is holding preliminary talks about a purchase of Steinway, according to one of the people, who asked not to be identified because the deliberations are private. The company, whose iconic pianos have been used by virtuosos such as Lang Lang, could fetch about $1 billion in a sale, the people said. Poly Group is doing due diligence work on Steinway as well as seeking financing and government approvals for an offer, the people said. 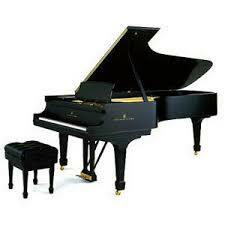 The piano maker has also attracted other potential buyers such as private-equity firms and companies, the people said. Steinway should be able to fetch a high valuation given that the company may reach 30 percent to 40 percent annual sales growth in China, according to Shaun Rein, founder and managing director of the China Market Research Group. A Chinese company like Poly Group could help improve Steinway’s distribution network in the country, which has been weak so far, he said. Poly Group started in 1992 as a supplier of defense equipment for the Chinese military. The conglomerate now has operations spanning explosives manufacturing, real estate, mining, cinemas and the arts. The conglomerate’s Hong Kong-listed unit Poly Culture Group Corp. owns China’s biggest home-grown auction house. It also runs a chain of theaters that have hosted musicals like “Cats” and performances by the likes of the London Symphony Orchestra. Paulson’s New York-based investment firm Paulson & Co. agreed to acquire Steinway in 2013 for about $512 million, beating rival bidders including South Korea’s Samick Musical Instruments Co. The piano maker that gave the company its name was founded in 1853 by German immigrant Henry Engelhard Steinway in a Manhattan loft on Varick Street, and over the following decades became a brand recognized worldwide. In March, it opened a new Asia-Pacific headquarters in Shanghai. This is what happens when "big money" takes over private business. Doubling his money is not bad for the original investor, but to have Steinway owned and operated by the Chinese, in spite of such growth in sales in that country, well, is not my cuppa to say the least! Steinway already has a presence in China with their "Essex" brand of uprights and smaller grand pianos. Their Boston or mid-price line is manufactured by Kawai in Japan (or perhaps other countries). The 45" Steinway upright (with their name on it) sells for approximately $28,000 while the Essex 45" Chinese piano sells for approximately $7740 or thereabouts. American schools are buying four Essex uprights for their practice rooms compared to the price of the genuine Steinway product. Quite frankly, I have worked on the Essex pianos and it is a very good value - as long as Steinway & Sons maintains a presence in China. Otherwise, any other Chinese pianos I have done work on I do not like one iota. They certainly make them "look" wonderful, but as musical instruments, much is to be desired. This is a sad state of affairs for pianos. Baldwin (since 1856 or so) was taken over by Gibson Guitar Company and soon stopped manufacturing the great American Baldwin piano. They did have their pianos using the Baldwin name made out of the country (China). Those Baldwins I never cared for. Now we see the rich Chinese (getting very rich on American monies) may acquire one of America's finest name-brand companies. Artists with whom I have talked about the new Steinways (they are Steinway artists) have complained about the quality and "singability" of the instruments since Paulson acquired Steinway for a bit more than a half million dollars. For him he doubles his money, which is fine for him. I just do not see the Chinese continuing or improving the product line no matter how much money is involved. This acquisition would also include the Hamburg, Germany branch of which many people think are finer instruments than their American counterpart, especially in the last decade. I generally agree. Heinrich Englehard Steinweg would probably be turning over in his grave if he knew of these circumstances. If they want to take profits, couldn't they at least find a S Korean to buy it? I cannot say very much good about Korean pianos either. Most tuner-technicians would agree. My point is if a Korean bought it, it would at least be owned by someone in a democratic country.